This HDMI extender 1x4 splitter extends 1 HDMI source to 4 HDMI displays over single CAT6/6a/7 cable up to 40m/131ft. The highest resolution supported is 1920×1080@60Hz,and it also supports IR passback, EDID pass through Only one power adapter for the transmitter is needed, the Receiver is powered by the transmitter over CAT6 cable. Ideal solution for HDMI exhibition, Video conference and show center, ect. 1. 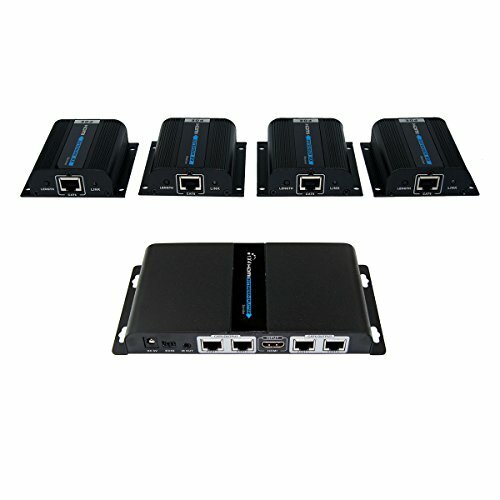 Distribute 1 HDMI source to 4 HDMI displays over network cable simultaneously. 2. Compatible with CAT6/6a/7 network cables, follow standard IEEE-568B. 3. The transmission distance is 40m/131ft. 4. The Highest resolution is up to 1920×1080@60Hz. 6. Support 20~60Hz IR pass back. 1. HDMI source device: computer graphics card, DVD,PS3, HD monitoring equipment etc. 2. HDMI display device like SDTV, HDTV, and projector with HDMI port. 1.Support power from transmitter to receiver unit over the CAT6 cable. Includes 1 Transmitter & 4 Receivers.Extend and distribute 1 HDMI source to 4 HDMI displays over CAT6/6a/7 network cable simultaneously up to 131ft. HDMI over CAT6 cable extends HDMI audio/video signals up to 131ft;Supports 480i/480p/720p/1080i/1080p at 60Hz and surround sound up to 7.1-channel or stereo digital audio; Good quality CAT6/7 cables are essential in delivering quality contents. HDMI Extender with IR infrared cables- You can control the HDMI source device at the receiver ends with the included IR cables. Support power from transmitter to receiver over ethernet cable, only one power adapter for transmitter needed for normal working.Built-in six EDID resolution option,allows the video source to send out a video signal that is supported by the monitor automactially. Easy installation - No driver required; Surface mountable metal housing allows easy placement;Sturdy metal enclosure provides durability and minimizes EMI/RFI noise interference.